One of the great things about being a harmless Suffolk eccentric is that you get to meet other harmless Suffolk eccentrics. I hadn't known Aidan Semmens very long, and Benhall was part of one of our first jaunts together. This site was on its first, fresh legs, and he was writing about churches for what in those days was still called, quaintly, Eastern Counties Newspapers. We would bounce ideas off each other to the advantage of both our work, and may one day even get round to writing that book we kept talking about. However, Benhall stalled us in our creative endeavours, because on that occasion we couldn't get into the church. 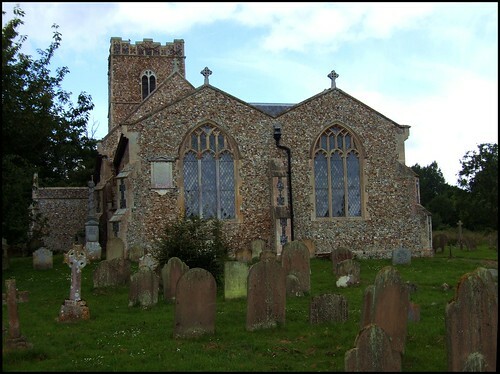 When I first wrote on this site about finding this church locked, in what was otherwise an area of open churches, I had a wry e-mail from the Archdeacon of Sudbury, telling me that, in fact, Benhall church was open daily from 9 am - 5 pm. However the door is heavy and some people find it difficult to open. The hand has to be turned to the right and the door pushed forward. Neither Aidan or I had ever laid claims to being macho, and so we enrolled on an intensive fitness programme at the local gym, limbering up to open stiff doors. But in fact it would be more than eight years before I came back to Benhall. Benhall is one of those parishes bisected by the A12. Unhappily, this cuts the church off from its village centre, but both village and church are in rather lovely settings, St Mary being reached down a long, straight high-hedged lane from the busy road. I freewheeled along, enjoying the birdsong and the emerging sunshine as July stuttered into life. Soon, the noise of the traffic fell away behind me, but as I approached the church a lunatic dog erupted in the garden across the road. I dare say that I was the first stranger it had seen all day, but its slavering barking suggested that it thought I was definitely up to no good. At first sight, St Mary is an entirely Victorian confection; the double-breasted east end consists of the original, repointed chancel, and a north transept and chancel aisle, both with 19th century windows. The style is similar to Somerton, across the county. The northern extensions were to contain an organ, vestry and schoolroom. On the eastern face of the original chancel, an internal memorial has been placed, rather ill-advisedly; the Victorians sometimes seem rather embarrassed by these, although they normally just banished them to the west end of the nave. Mortlock thought that the tower showed signs of being early, with late Saxon work at three of the corners; but, as he says, the 19th Century touch is so overwhelming elsewhere, there is no reason to think it original. It certainly doesn't look older than about 150 years. As I wandered around the church taking photographs, the dog kept up its hellish litany, verging on the apoplectic whenever I came back into view. I wondered if it did this for church services as well - if so, Benhall weddings must be fun. I found that by jumping up and down and waving my arms I could raise its anger to absolute fever pitch. However, reasoning that if it broke through the fence and rushed across the road, the smile would be on the other side of my face - if, indeed, I still had a face at all - I decided to curtail my amusement and have another go at that south door. There is a substantial south porch, with the first inkling that this church is something rather interesting after all; a large, Norman doorway. It shows signs of being recut, but is in its original place, and is perhaps the clearest inclination of the date of the superstructure of the building. The door opened easily. The interior is clean, light and well-kept, a pleasing balance between old brick floors and early 19th century furnishings. This is essentially a Georgian interior, from the days of the Rector John Mitford, brother of the more famous Mary. The pre-ecclesiological features include a gallery, a double decker pulpit looking along the ranks of box pews, and a curious birdbath font on a stubby stem. The clear glass of the windows benefits the nave, filling it with a simple, restful light. To step past the organ in the transept, and into the chancel, is to enter a part of the building with a quite different feel. Unfortunately, the fitted carpet makes a view of the church's brasses and floor slabs impossible - there are three sets of brasses to members of the Duke family, and Sam Mortlock was most impressed by them when he came here in the early 1990s. I don't know when the carpet was fitted, but it did occur to me that if I had bothered to come back to Benhall sooner then I would have seen them as well. The striking memorial on the north wall of the chancel is to another Duke, Sir Edward, who died in the 1730s. An antiquarian, he used the opportunity to record almost 150 years worth of his forebears, which must make him very popular with his own ancestors if any of them are genealogists. Benhall church is a simple, restful place, off the beaten track and probably little-known. But I was glad I'd come back, and as I waved the dog a cheery goodbye, he whined and put his head between his paws, perhaps reasoning that he might have to wait some considerable time before he had any more fun.